December is generally a fairly slow month for us, but this week was special because as our mail arrived… there it was, “Congratulations! You’re a Favorite Place on Google”. They sent us a nice letter and a window sized poster/ decal with a QR barcode that I’m told will take you to our Google listing. Most smart phones (or at least iPhones and Androids) can get an App that will read this little black spot, and do some 3G internet magic. We focus on local San Diego customers, since that’s where we can best control the quality, unique solutions and services our customers have come to expect. So we have worked hard on our web site in the last year as a place for information on safety and security for San Diegans. Although we are happy when anyone goes to our site for information we really hope that local San Diego people, who we might actually service, go to our site. It was exciting for us to see that, because so many people used Google to find us, we are now in the top 1% of the US business sites that Google indexes. Now we want to see that the QR Barcode actually works! We are offering a free gift and 10% off any purchase if you come and read our barcode during business hours. 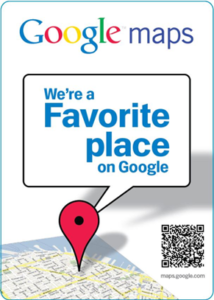 You will find the Google poster near our front door on the corner of 10th and University and at our front counter. So Free Goods and discounts too! Just get the QR reader app on your phone (you know that’s why you got your fancy phone) and come down to our storefront and see if you can read our Google poster. (Offer good until Jan 30th, 2010) We’re here Monday through Friday from 7AM to 5PM. We are looking forward to seeing you at Grah in 2010!